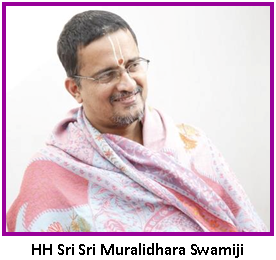 Categories: Divine Names, Sri Sri Muralidhara Swamiji. This series chronicles interesting experiences recounted by the devotees of His Holiness Maharanyam Sri Sri Muralidhara Swamiji. These articles are translations from the series, “Madhuramaana Mahaneeyar” published every month in Madhuramurali monthly magazine. The original article was written by Dr. Bhagyanathanji, Personal Secretary of Sri Swamiji. While all of us who heard him felt stunned, there was one from amongst us who began to quickly calculate the number of years left to enter the next century and wondered aloud how it was possible to reach the Mahamantra in every home by the turn of the century which was only a few years away! Our intelligence is limited. To gauge its success with limited understanding would only raise doubts. But is not will of the Lord and Guru beyond everything? From the life history of several Mahans we learn that their work for the welfare of the world, for which they come, is somehow carried out. Once Sri Swamiji participated in a public program. The organizer of an important television channel was also present. That man who was devoted to God and had a good heart, prayed to Sri Swamiji, “Your wonderful words of grace should reach all through our TV channel. You must please oblige.” Sri Swamiji acceded to his request. That TV channel video-recorded Sri Swamiji’s words of grace and relayed it on their channel from the year 2000! In this, Sri Swamiji began his talk only with the chant of the Mahamantra, thrice. It was only after listening to this that we found the answer to the question that had been haunting us the past few years. It was really amazing. We felt very happy over the wonderful way in which Premika Varadan had fulfilled our Sri Swamiji’s desire to reach the Mahamantra to every home! Sri Swamiji’s words of grace and the Mahamantra reached every home!